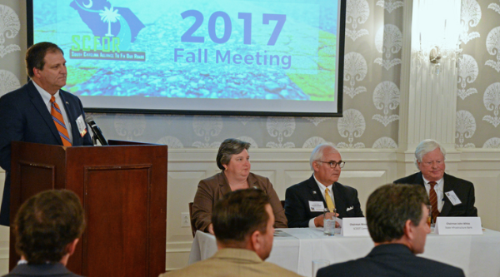 We were pleased to have over 130 attendees from transportation and elected officials, state-wide associations, and businesses attend our fall meeting on Tuesday, October 24, 2017, at the Palmetto Club in Columbia, SC. 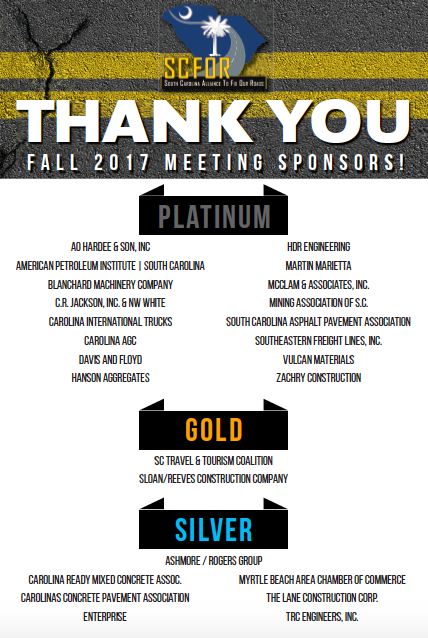 Thank you to our sponsors who made the event possible and our panelists & honorary guests for providing vital insight about the plans – enabled by the roads bill – to rebuild and improve South Carolina’s transportation infrastructure system. The following transportation officials provided an update on the new progress being made and an overview of what to expect in terms of our future transportation system. View Secretary Hall’s PowerPoint presentation by clicking here. 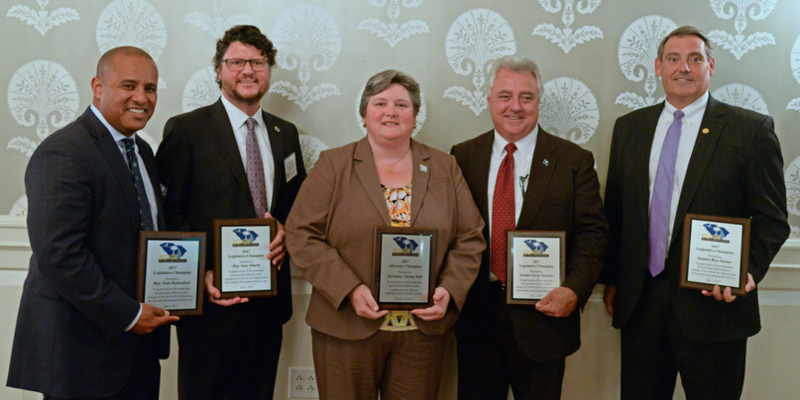 Pictured L-R: SCFOR Chairman Joel Reynolds, Secretary of Transportation Christy Hall, SCDOT Commission Chairman Woodrow Willard, SC Transportation Bank Chairman John White. The Status of Federal Infrastructure Funding Activities in Congress. Greg Cohen, President of the American Highway Users Alliance provided an overview and forecast of what to expect regarding the Trump administration and Congress’ plan to fund the national transportation system. His presentation on federal transportation funding activities can be viewed here. During our meeting, we celebrated the historic passage of Act 40 with our 2017 Transportation Advocate and 2017 Legislative Champions in attendance. We are both honored and grateful to recognize these individuals for their contributions on the roads bill which was instrumental in its passage. SCFOR wholeheartedly endorses their leadership and dedication to improving the state of South Carolina. Thank you to our sponsors and attendees for making this year’s meeting a success. Moving forward, we hope to continue collaborating our forces with you and other organizations. Together, we can work to preserve the progress we have made and ensure transportation funding stability in the 21st century. Please know that partnerships and sponsors are vital to our success – and they are truly appreciated. Thank you!